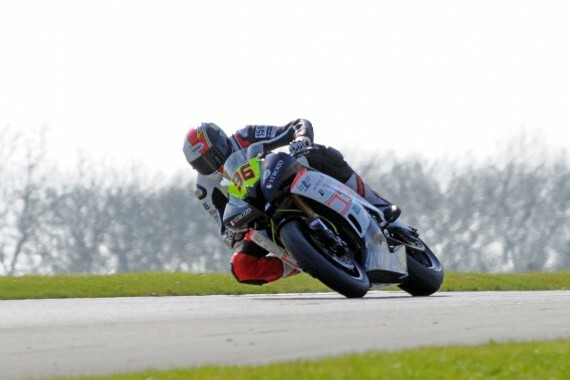 Ryan Dixon got his season off to the best possible start at Donington Park over Easter with two points finishes. Dixon made the move to race in the Motorpoint British Supersport Championship and it is already looking like the bold decision is paying dividends. Competing in the Evo class, Ryan scored two points finishes in the sprint and feature races on the opening weekend of the season, leaving him full of confidence heading into his home round of Brands Hatch next weekend. Here Ryan brings us up to date with his weekend. We arrived at Donington in somewhat less than desirable conditions. Despite the pouring rain, we went about setting up camp. Eventually we were done and ready to go for the weekend, albeit a little damp! Saturday morning came and we were the second session out. Due to my fairly tight budget, I decided to run part worn tyres for free practice one and two on Saturday and just use the sessions to get the bike set up and ready for qualifying and the races later in the weekend. Managing to match my previous best laptime at Donington, I was pleased with how the free practice session ended, with me being 29th overall in the whole Supersport class and classified in 17th in the Evo class which is the main classification to watch out for. Sunday lunchtime saw qualifying. A new set of tyres and a great amount of determination saw me managing to knock of 0.7 seconds from my free practice laptimes, however, despite this I managed to go backwards three positions on the grid for Sunday afternoons sprint race, showing just how competitive the Supersport class is! Early evening Sunday was time for our ten lap sprint race, I set off and got a fantastic start managing to make up a few positions heading down to turn one! I was running a few places up from where I started but the race was red flagged after a crash on lap four as there was gravel all over the track. This left us with a six lap dash at the restart. Again, I got a strong start but was run wide at turn one, losing most if not more positions than I had gained. However, I got my head down and pushed on to come home in 24th position in the overall race but 15th in the Evo classification meaning a championship point at the first attempt! Monday saw our feature race, a gruelling 18 lap race in glorious but very warm conditions. Starting from 30th, I got another cracker of a start but was run wide at a couple of corners. I got myself into a bit of a fluster and lost a few more positions before getting back into my rhythm and chasing down the riders in front. I managed to catch and pass a few and that coupled with other riders making mistakes meant I was able to pull back through to 22nd overall and 12th in the EVO class at the finish, claiming four more points in the championship hunt. Leaving round one, I am happy with my performance, two solid races and finishes with points scored in both. Nothing silly and slowly moving forward which is exactly what I aimed for. I am currently lying 15th in the EVO championship as we head to Brands Hatch in a fortnight for round two of the championship! This entry was posted	on Saturday, April 11th, 2015 at 8:57 am	and is filed under Featured, Motor Racing. You can follow any responses to this entry through the RSS 2.0 feed. Both comments and pings are currently closed.